Brandon Howard: Is Roman Reigns Really A Bigger Draw Than John Cena? Is Roman Reigns really a better ticket-seller than John Cena, as Reigns insinuated in a promo on the September 11 edition of WWE Monday Night RAW? Reigns’ comments (which can be seen in the YouTube video embedded above, starting at 2:57) were likely scripted and written more to get through another week of TV as WWE continues to build to a Reigns vs. Cena match at the No Mercy pay-per-view on September 24. His comments were probably not written with a lot of concern for being factually accurate. As Vince McMahon might say, the comments were likely for entertainment purposes only. Nonetheless the promo raised interesting questions around WWE business. You came to Monday Night RAW and you called me out, and I wonder why that is. Maybe it’s because I’m selling the tickets that you haven’t sold in five years. You say I’m not doing my job. Ticket sales are great. Revenue is sky high. WWE can make it without you. That’s why you don’t like me. WWE don’t need you, John; you need WWE. In this excerpt there are at least four factual claims being made about WWE's business. Let’s go over them in order of how difficult they are to verify. What’s he saying? This is vague and metaphorical but Reigns is boasting that WWE’s revenue is increasing, probably overall revenue. How can we test this? This is easy to research as WWE publishes how much revenue it makes each quarter. Is it true? Reigns’ casual “sky high” remark is nebulous but WWE’s revenue has increased every year since 2003. 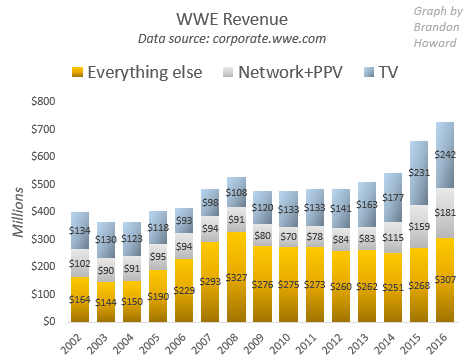 Revenue especially increased since 2014 due to the beginning of a new set of deals for guaranteed escalating TV rights fees and due to the WWE Network taking more revenue in-house as compared to the pay-per-view business. The tone of Reigns’ comment suggests the increases in revenue are in large part thanks to his contributions, however, which is questionable. What’s he saying? 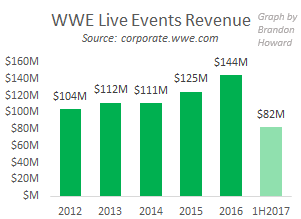 WWE’s live event business is doing well. How can we test this? WWE makes this pretty easy too. In its public documents the company splices out “Live Events” as one of several segments of business. Revenue reported under the “Live Events” segment consists of ticket sales and travel packages for events. Revenue, average attendances by quarter and average ticket prices are each broken down by region (North America and International), all of which are reported quarterly. Is it true? Sort of. Year-over-year ticket revenue and total attendance are increasing but main roster average attendance per event hasn’t changed much in years (hovering around 6,000). 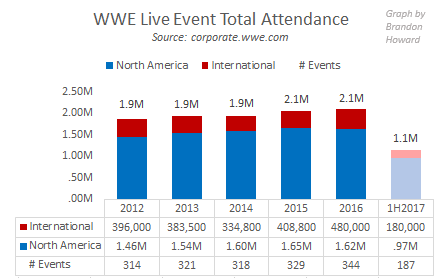 Live Event revenue and total attendance are helped by WWE running more events now than it has in many years, thanks to the brand split and more NXT events. 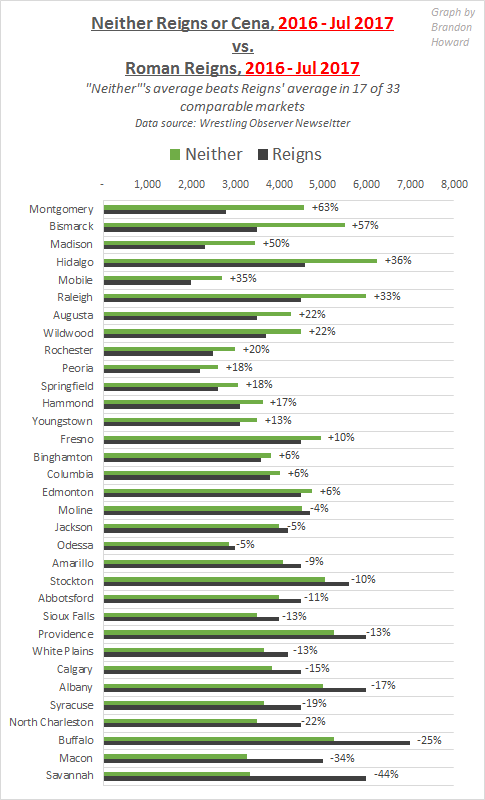 Average main roster ticket price is also increasing above the rate of inflation. Again the tone of Reigns’ comment seems to suggest he should be credited for WWE’s healthy ticket sales, however (as we will get into) it’s not clear he makes a positive difference in most markets. What’s he saying? Reigns is claiming he’s a better live event draw than Cena has been in the last five years -- which would mean since 2012. How can we test this? This is more difficult to test. 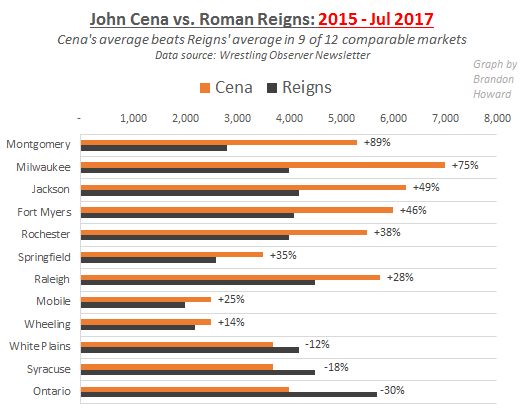 The best way to test this in my opinion is to do a market-to-market analysis: to compare house show attendances in cities in which Reigns appeared but Cena did not, and vice versa for those same cities. Since WWE doesn’t publish attendances for individual events we will rely on attendance reports collected from the Wrestling Observer Newsletter. Is it true? No. As I will show in this article, there’s strong evidence to suggest Cena is a superior attendance draw to Reigns. What’s he saying? It seems he’s saying WWE would be at least economically sustainable without Cena. How can we test this? This is most difficult to test on the whole; ideally, we would need to simulate an alternate reality in which Cena is no longer working for WWE. We can however consider to what extent WWE’s business would be hurt in the absence of Cena’s superior attendance drawing power (as I did last year). We can at best make educated guesses about how other areas of business would be affected. Is it true? In my opinion, yes. In the unlikely scenario Cena permanently leaves WWE -- assuming he didn’t leave to work for a competing wrestling company -- WWE would be hurt but would still be a profitable business. The Network makes sales directly to consumers, eliminating the middleman of the cable or satellite PPV provider, but also raising the cost as WWE has to provide the service itself. So while revenue is up substantially in that area of business, it’s reflective of a change in the company’s business model and not reflective of any increased interest due to a star like Roman Reigns. WWE signed its latest TV deal with NBCUniversal, the parent company to the USA Network, in May 2014. Up to that point Reigns had been a member of a strongly pushed stable. It was shortly before the Shield broke-up and Reigns began to become a main event singles wrestler. Arguably every on-air talent in WWE should get at least some modicum of “credit” for the value of the TV deals the company is able to obtain. But if Roman Reigns had not decided to become a pro wrestler, would WWE’s TV deals be any less valuable today? That’s very doubtful in my opinion, especially considering the current deal with NBCUniversal was finalized before Reigns was really a main eventer. Yet Reigns is a top star on RAW and, if YouTube views are any hint, he probably drives traditional TV viewership to some degree as well. He’s one of the key players in the product WWE airs weekly for USA Network and other partners around the world. So maybe he deserves some larger share of credit from that angle. But again, if Reigns never signed with WWE, are TV ratings any worse? Some would argue ratings would indeed be better if the resources used for Reigns had been used for others instead. Average attendance per event has hardly changed since Reigns became a top star. Total attendance has increased slightly and, as mentioned early, is largely due to the increased number of events since the brand split. That’s not something we can give Reigns credit for. Live event revenue is up more significantly. Obviously that’s partly driven by the increased number of events and emergence of NXT. NXT also drives a few million dollars in revenue that is counted in the Live Events revenues shown above. Obviously increases in revenue due to NXT would not be attributable to Reigns who doesn't appear on those events. 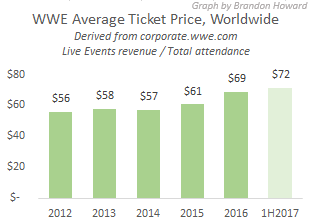 Most of all the increase in Live Event revenue is also due to the increase in the average main roster ticket price. Worldwide, ticket prices on average have been marked up $16 since 2012. It’s arguable that Reigns could take some credit for the increase in ticket prices. If ticket prices have increased because fans have become more passionate in recent years, maybe that has something to do with Reigns -- as well as a lot of others. This is the most clearly false of his claims. Cena has been a demonstrable positive difference-maker to house show attendance for most of his WWE career. Reigns falsely implied that within the last five years, Cena had been a weak attendance draw, at least compared to Reigns himself. 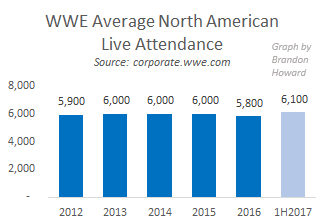 I looked at North American house show attendances since 2012 for cities in which there is at least one reported attendance for an event that featured Reigns but did not feature Cena, and vice versa. To be fair to Reigns I also only want to consider his attendances from 2015 and onwards, after he became a top singles star. Cena’s record beats Reigns’ in 22 of the 28 markets. 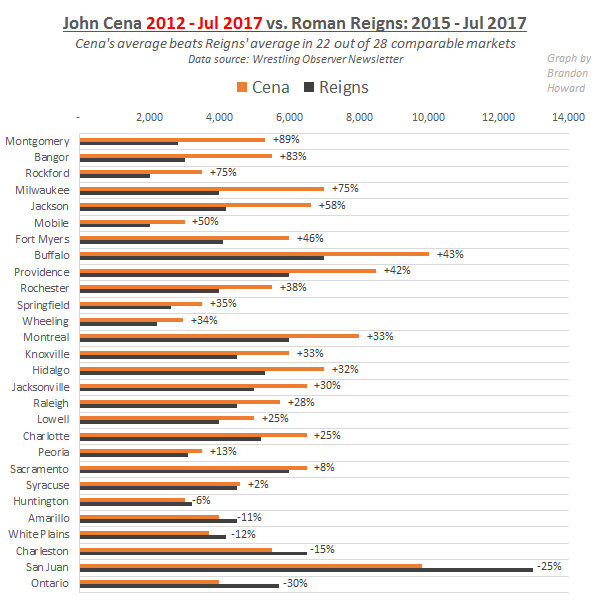 On average, Cena made a 29% positive difference over Reigns’ attendances in these 28 markets. Just in the markets where Cena "wins", he makes a 41% difference. Reigns made a 21% difference in markets he "won". Perhaps Cena has weakened as a house show draw in more recent times though. Let’s look at the same time frame for both: 2015 to Jul 2017. Of the 12 markets that fit the new criteria, Cena outdrew Reigns in 9 of them, making on average a 28% positive difference over Reigns, or a 44% difference in markets Cena "wins". Reigns made a 26% difference in the 3 markets he "wins". In fact Reigns’ attendance performance is on par with WWE house shows that feature neither Reigns or Cena. In the period since Reigns has been a top star, the house shows with neither Reigns or Cena outperform Reigns more often than not. The “neither” shows beat Reigns’ shows in 36 of the 67 comparable markets: a little more than half the time. Maybe Reigns drawing power has increased over time. Does he fare better if we cut out 2015 and look at 2016 to Jul 2017? The results are similar. “Neither” shows beat Reigns in 17 or 33 samples. Again that’s a little more than half. Given the narrow margin between Reigns’ attendances and those of “neither”, I would not conclude from this that Reigns is a negative draw, but that he’s not a significant attendance draw. McMahon was referring to whether injuries hindered WWE’s business. There are some insidious implications for that comment in my opinion. For example WWE keeps many of its wrestlers on the same level as stars and misclassifies those employees as independent contractors to avoid paying benefits and taxes. Nonetheless there’s truth to Vince's statement. The company isn’t going to fall apart if even its biggest star left. In the unlikely event Cena leaves WWE, the company would be hurt financially. The difference Cena demonstrates he makes to house show attendance alone could be worth $3.5 million. Other losses WWE might incur are harder to measure. It’s likely the company would have a harder time negotiating for favorable TV rights fees (WWE’s biggest source of revenue) from partners like NBCUniversal if the biggest star in wrestling was no longer appearing on RAW or SmackDown. Arguably, WWE Network subscriptions could suffer, especially if star power didn’t surge in Cena’s absence. Certainly merchandise business would take a hit as Cena is believed to be the long-time top merchandise seller. WWE reported $80 million in OIBDA in 2016. Chief Financial Officer George Barrios remains confident the company will reach a record $100 million to close 2017. So WWE is a healthy, profitable business that would likely suffer without Cena, but, especially if he didn’t move to a help another truly competitive wrestling promotion, WWE would likely remain profitable and atop the wrestling industry. So yes, WWE can make it without John Cena, but it would be hurt if he abruptly left. Follow Brandon on Twitter at @BrandonThurston. Email him at [email protected]. Brandon co-hosts Wrestlenomics Radio with Chris Harrington, a podcast about wrestling business.